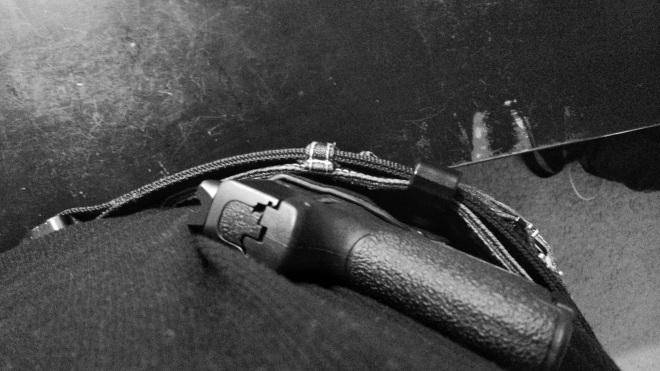 The INCOG holster was designed to be very versatile. It could either be carried with 1 or 2 clips, or use in combination with the magazine carrier. It also has adjustable height, cant, and retention. The 2-clips configuration is definitely more sturdy, and there will be no shifts to where the gun will be throughout the day. However, the 1-clip configuration gives is easier to put on and off, and allows a little angle shift if you sit a lot during the day. 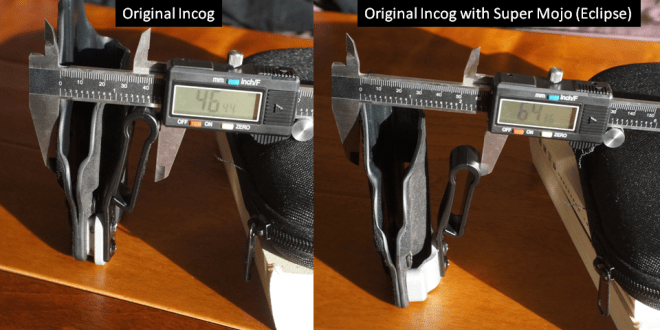 Read this post for a detailed review of the original INCOG holster (and comparison to the Phlster Access holster). The original INCOG with Smith & Wesson Shield. Carrying the INCOG around 2:00. Overall, the INCOG -makeshift- “Eclipse” was just as easy to carry as the original INCOG. 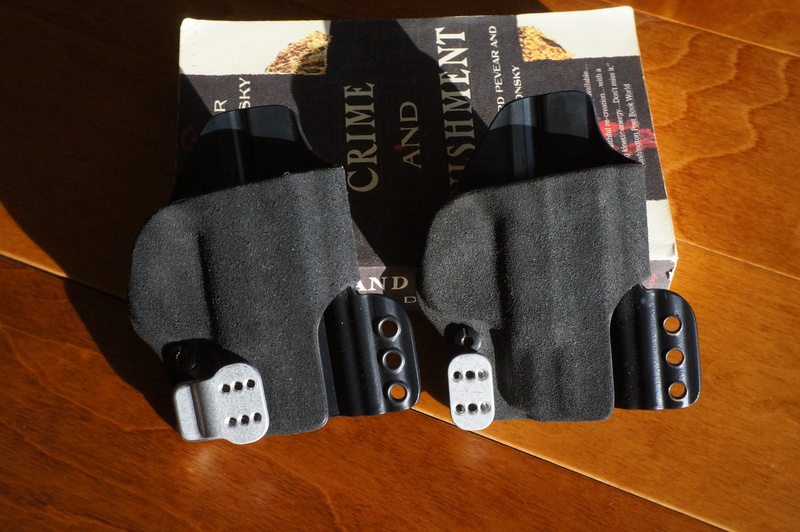 If you order the actual Eclipse holster, it will still have adjustable height, cant and retention. The actual Eclipse holster won’t have the ‘tab’ near the front sight of the gun, which is where the magazine caddy would attach to the original INCOG. Some online reviews have expressed concern as to how the position of the clip may interfere with ‘indexing’ your finger while drawing. I don’t find that to be an issue. 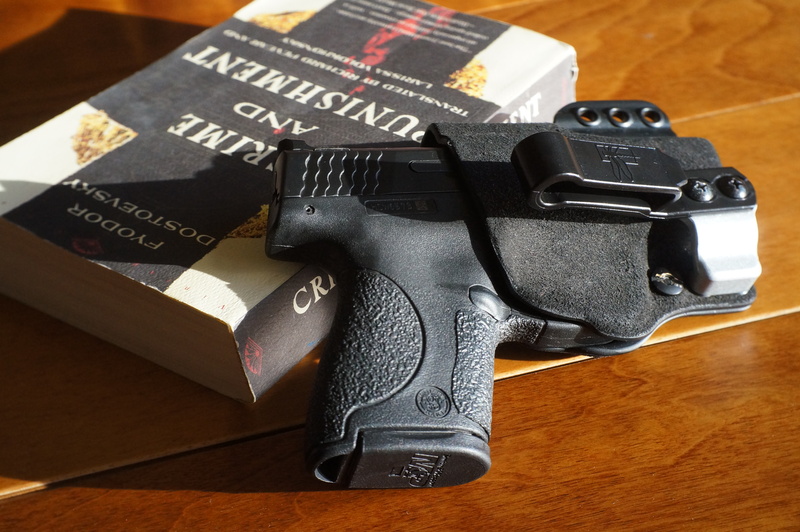 It is essentially the same as drawing from any holster with a center clip. The bottom line is, if I could obtain a firm and proper grip while drawing, my index finger will land where it should be after I draw (i.e., next to the slide, above the trigger). INCOG -makeshift- “Eclipse” with the Smith & Wesson Shield. 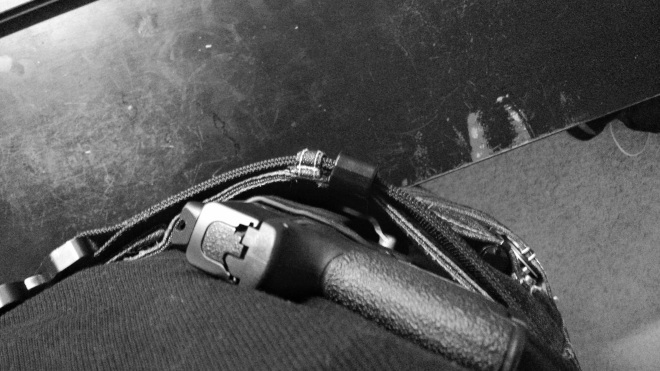 Carrying the INOCG with Super MOJO riser. Notice the clip is closer to the center of the gun. Because the clip of the Eclipse is at the center of the holster, the overall thickness of the holster increases by quite a bit (see pics of measurement below). The difference is about 2cm (~0.8 inch) before compression. So the difference is probably about 1-1.5cm when it is actually inside the waistband and the clip is slightly pushed towards the body. The original INCOG at its thickest is 46mm vs. 64mm when using the Super Mojo riser, which is what the Eclipse would be. The G-code INCOG clips have an angle (and some springy-ness) to it, which aids in pushing the grip of the gun into the body. Since the Eclipse has the clip closer to the center, the force of the clip is applied equally across the grip, whereas 1-clip on the original INCOG (clip on the grip side) pushes the end of the grip into the body. I find that pushing the end of the grip aids concealing more than the whole gun. Equal force pushing on the whole grip leaves the corner of the grip more likely to print (a little) through clothing. I prefer the force of the clip pushing mainly into the grip. BONUS: I prefer the capability to add a magazine caddy, which is one of the main reason I wanted the INCOG holster to begin with. Would I consider the Eclipse if I didn’t already have the original INCOG, and I’m looking just for a single holster that doesn’t need the capability of an attached magazine? Yes. Yes, because it is still a very versatile holster due to the adjust-ability (i.e., height, cant, retention) and quality of G-code. If there is no need to attach a mag-caddy, the fact that it has no extra material sticking out from the side (i.e., the part use to attach the mag caddy) is an advantage over the original INCOG as well. Importantly, my preference is based on how I carry and my body type. I carry more around 2:00, and I actually prefer the 1-clip on the INCOG pushing the grip into my body. If somebody carries around 1:00 appendix, the Eclipse might actually work better because it will exert force on the whole gun (across the slide and grip), pushing the entire gun into the body and aiding concealment. So, if unsure whether the Eclipse is suitable for your need, just buy the Super Mojo and give it a try. If you don’t like it, you can easily sell it on ebay or other forums. Great article . I have done alot of research on incog. It will be my next holster. 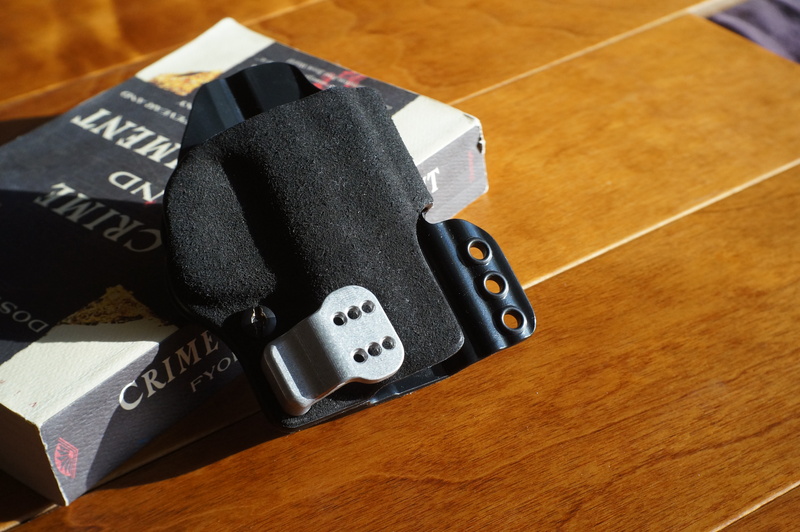 I would suggest if you don’t plan on carrying a magazine, you could order the Eclipse holster (no magazine tab) with the original mojo belt clip riser ( not the super mogo). Hey thanks for the comment 🙂 Now when I don’t carry a spare magazine, I use the PHLster ACCESS holster, which is even more minimalist than the INCOG. And when I do need spare mag, definitely the INCOG. 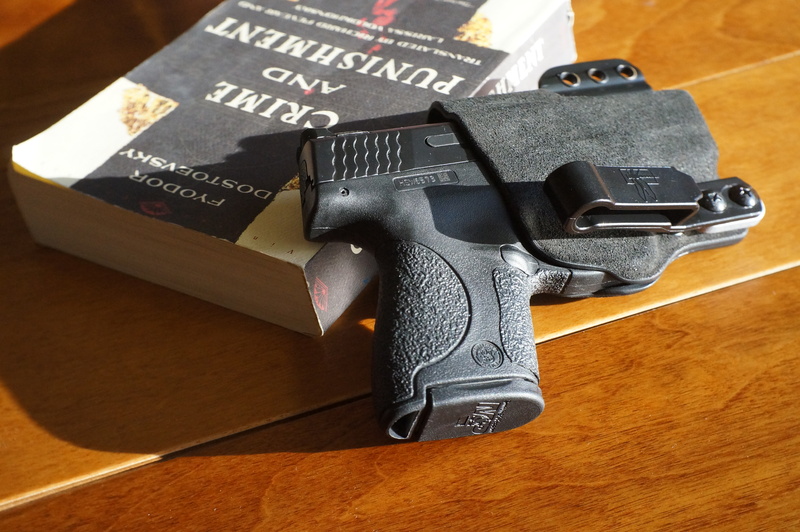 A lot of other holster makers are using similar designs now (with a magazine carrier right next to an appendix holster), but the detachable and height-adjustable magazine carrier of the INCOG still makes G-code the best choice in my opinion.